We don't take many long or distant vacations. Having put three kids through college without any debt to speak of, we've been known to pinch pennies. However, our youngest daughter Molly recently spent a semester near Dublin, and I thought it would be great if we could go over for a week or so at the end of her term. We got there and back, with a few fairly minor hassles, but with a lot of mass transit experience. We'd been warned not to drive in Dublin. Plus, Molly told us that she had gotten almost everywhere she wanted to go on the "DART," the Dublin Area Rapid Transit rail system. By the way, before the trip, we acquired a copy of Rick Steves' Ireland 2012 book. Later, when I realized we were making a side-trip to London, we got ahold of the Rick Steves' Great Britain 2012 book as well. We studied the relevant parts of each and followed several of his recommendations. Although we occasionally found something that had changed since the book was last updated (like hours of operation or ticket prices), both books saved us lots of money and countless precious hours. Here's one way to think about the value of planning, using hypothetial figures. Let's say that 7 days on the ground in a foreign country is going to cost each of you $2500 each in transportation, lodging, and meals. Figuring 12 walking-around, sightseeing, touring, and relaxing hours a day, that's 84 hours of actual vacation (not counting time cooling your heels at airports or stations on either end of the trip). Dividing $2500 by 84 is $29.76 per person per vacation hour. So if two of you waste an hour a day in lines you could have avoided with better planning, that's $417 worth of your vacation. I didn't supply this example to make you paranoid or testy when you miss a bus by 10 minutes, but to get you thinking about how you want to structure your days, what you want to see, and how you plan to get there before you get onto the plane. Once we had decided to go for sure, Shelia used an online trip planner to try to find flights we could take. The best flights for us (flying out of Dayton, Ohio, connecting in Atlanta), seemed to be on Delta. But that site wouldn't let us reserve seats. Shelia then tried to reserve seats through Delta's web page and phone calls to Delta. She learned that there were open seats on all of the flights we needed. But a help desk worker told her that the open seats on two of the flights were reserved in case a "preferred" customer needed them at the last minute. So they wouldn't let her place a reservation until a day before the flight, not exactly a good way to make travel plans, especially on flights that you need to make connections to other flights. So I went through Orbitz and got exactly the same flights that Shelia had tried to book. Ironically, the Dayton-to-Atlanta connection was the hardest bit of the journey to book - the Atlanta to Dublin and vice versa flights were not nearly as bad to squeeze onto. Once I got our flights booked, they popped up on the Delta site an hour or so later, and from that point on, the Delta people were quite helpful. Molly was lodging at a church- and university-afilliated facility at Greystones, a charming coastal town well south of Dublin. We figured that it would make more sense to stay at Greystones than to try to get a room closer to Dublin and have to figure out how to meet up every day. 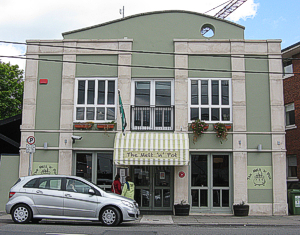 When we tried to find a Greystones hotel or B&B on the internet, we saw that several of them had gotten poor reviews about 2008, but the reviews were better lately. On closer reading, we realized that the bad reviews really had to do with a big construction project at Greystones harbor. Later reviews were more favorable, though, so I reasoned that the construction must have finished. With Molly's help, we were able to stay at the facility where she had been studying, at a significant cost savings. So Greystones it was. The photo to the right shows two travelers on a cove of the Irish Sea, just downhill from where we were staying. Once we had our flights to Ireland and our lodging reserved, I started looking for things to do, especially day trips. As it turned out, the Railway Preservation Society of Ireland had a series of live steam excursions scheduled for the last weekend we would be in Ireland, including some journeys behind a restored Irish steam locomotive. Sadly, the trips that would have been most interesting was too close to our return trip - any little glitch and we'd have missed our Delta flight back to the US. So I had to tell the nice people "no thanks." The RPSI is based near Belfast and has a permanent facility there I may try to see if I ever get back. Plus, they schedule several excursions each year. So if you're heading toward Ireland, check out their web page before you finalize your dates. Irish Rail offers a few family-oriented "Educational Tours," some of which feature Thomas or the Hogwarts express. 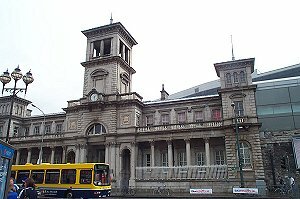 Other companies like Rail Tours Ireland offer day-trip and overnight journeys all over Ireland, mostly leaving from Dublin. As soon as we got lodgings and flights to Ireland taken care of, I realized that both Shelia and Molly both really wanted to visit London if we could squeeze it in. So we started researching transportation and boarding all over again. Molly had already flown to Paris on a discount line called Ryan Air, so we checked out their flights between Dublin and London. If you fly during the "off hours," their flights are very affordable. So I went through the Ryan Air reservation system several times, trying to get the flights we wanted - if you make one mistake or take a minute too long to get your credit card number into the system, you have to start all over. In my case, that actually increased my chances of making mistakes, because in my hurry to get back through the multiple screens, I would miss checking (or unchecking) something that I had already checked (or unchecked) multiple times and be surprised when it turned up (or didn't turn up) on the final checkout screen. As an example, if you accept all the defaults, you will find yourself paying for checked luggage, whether you have any or not, buying "RyanAir-approved" luggage you don't need, and so on. Oops, back to the beginning again. Finally, I entered our credit card number, but Ryan Air's site informed me that our credit card company had turned down the charges. Within a few minutes our credit card company phoned me to warn me that someone was using our credit cards to charge tickets in Europe. So I gave them the dates of travel and they put a note in our file to allow European charges until our flight home. In the meantime, Ryan Air's web site notified me that they had run our credit card through again and we had a reservation after all. But I couldn't get back into their system to print our boarding passes using the reservation number they gave me. That part's important, because if you show up at the terminal without preprinted boarding passes, they will charge you another $50 apiece. I spent several hours over the next two days, just trying to get through to that screen, until I began to wonder whether - in spite of our "reservation number" - Ryan Air had even reserved our flights. I also kept checking with my credit card issuer to see if any charges had actually gone through. None had. Yet. Finally, I finally crossed my fingers and started all over again on the Ryan Air web reservation system. This was a risk, because once you register for a flight on Ryan Air, you can not get a refund, even the reservation is a duplicate caused by you accidentally hitting the "submit" button twice. The upshot of it was that three of us flew from Dublin to London and back, for about $500 US, (counting airport fees, taxes, and other things that Ryan Air doesn't have any control over). But if we had accidentally reserved our seats twice, we'd have been out $1000 with no chance of reimbursement. As it turned out, Ryan Air had not actually run my credit card again - despite their message that they had and the useless reservation number they gave me. So it was a good thing I took the chance and redid the reservations. That said, Ryan Air's rates were very good, and now that I have a better sense of how to navigate their web page, I would use them again for a short flight. Just be sure to read all the fine print when you order, and to preprint your boarding passes. We also made reservations at a London Bed and Breakfast that was recommended in Rick Steves' Great Britain 2012 book. It was in the neighborhood called Belgravia, about three long blocks from Victoria Station, where you could catch the "Tube" to anywhere. It was even closer to the bus station, which we hardly actually used, although we may use it if we ever get back - busses have advantages over the Tube for certain trips, as we eventually learned (more later). A DC-9 got us from Dayton to Atlanta (a bit over one hour), and a 767 got us to Dublin (about 9 hours). Of course the total trip was closer to 12 hours, counting the lines for baggage check, etc. Having left Dayton in the mid-afternoon, we arrived at the Dublin airport about 9:00 the next morning Ireland-time and started looking for the bus to get us to Dublin. Air-something was all we were told. Turns out, there's an "Airlink" and "Aircoach" bus line and others that will get you from Dublin airport to Dublin. After getting off at Dublin's Terminal 2 and following the signs for bus service for about a half-mile, we saw a place to catch the busses. The one we wound up taking would only take cash, and the ticket agent would not answer questions until we had cash in hand. So we changed some dollars into Euros at a nearby currency exchange booth. We bought passage all the way to Greystones, avoiding the connection to the DART. It probably cost about the same as going into Dublin, then catching the DART, but it took an extra hour, because of all the narrow streets where the bus had to stop at the end of the block and let the oncoming traffic get through before proceeding. As you might be able to tell from the little photo, riders on these busses sit up fairly high, the way they do on tour busses, and for the same reason - your big luggage pieces are stored underneath the passenger compartment. On this trip, we were sitting on the left side in the first row, and the driver was sitting on the right. So we had an unimpeded view of the city streets as the driver navigated them. Our driver was courteous to other drivers, don't get me wrong, but again and again, as I looked ahead at the narrow streets with cars parked on both sides, and moving vehicles trying to go both directions, I thought, "How is he going to squeeze through there?" It was like going through the eye of a needle again and again. Later, this performance was repeated on a tour bus to Galway, two Airlink busses, and two London doubledeckers. The top-heavy busses sway back and forth, start and stop abruptly, and somehow manage to get through again and again without clipping rear-view-mirrors or worse. (On our bus trip to Galway, when two tour busses had to pass on a narrow country road, the driver of the other bus reached out and pulled his rear-view mirror back, but that was the only accommodation we saw.) It was not hard to tell where J.K. Rowling got the inspiration for Harry Potter's "night coach" experience - except for the sliding bunk-beds and the talking shrunken head, our experience was very similar every time we got onto a bus. In the meantime, we saw a street-level view of every small town between Dublin and Greystones - something that would not happen again during our stay, because from that point on, we took the DART, whose tracks mostly run along the ocean. 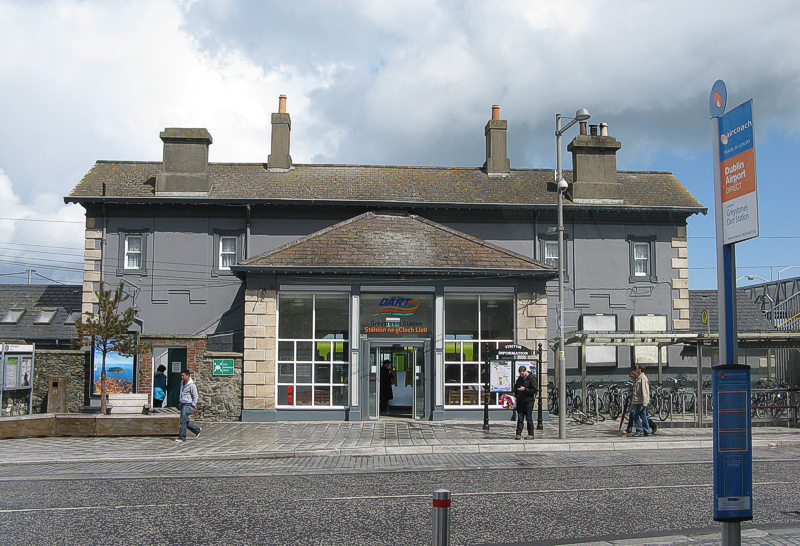 Like several of the other DART stations, the Greystones station show evidence of having formerly been a traditional full-service railroad station. Some of the intercity trains stop there as well - you can tell the difference because they have diesel-electric locomotives and are much louder. One nice thing about the station - there is a station agent there who can sell you the appropriate tickets or passes if you have the approximate price in Euros. Though we had a bit of a mixup, Molly met us at the DART station a few minutes after we got there. She walked us down the hill to the place where we were staying. 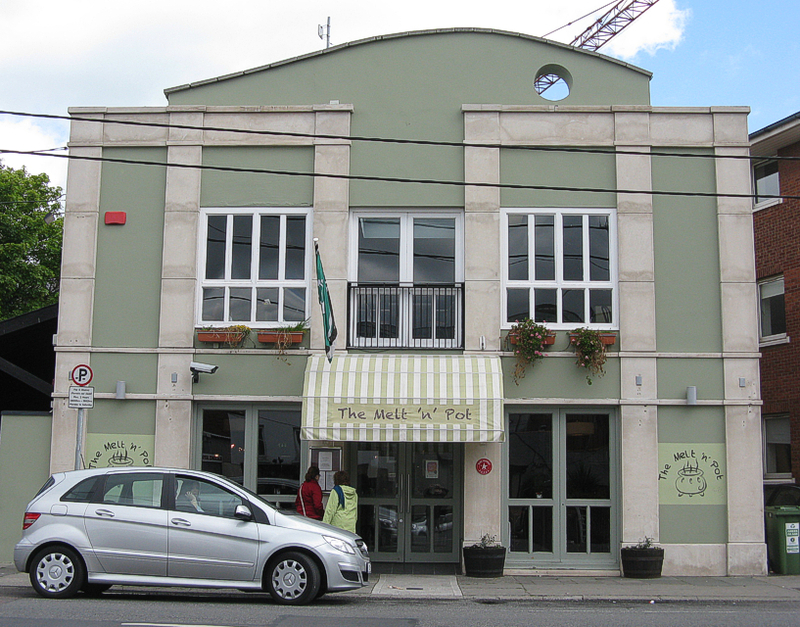 We unpacked and hopped the DART to Blackrock, where we had lunch at the "Melt'n Pot," a restaurant with great chowder and a big-screen television showing the Snooker finals, which were also a new experience for us. 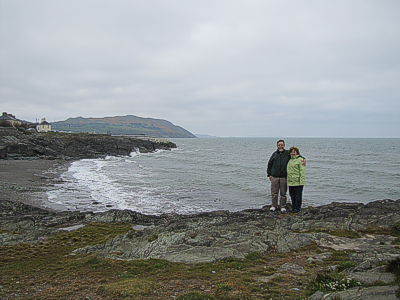 Later we went for a walk on the beaches at Greystones. There are sand beaches for swimming, and other shores where you wouldn't want to swim, but the beachcombing is great at low tide. Click on the photo of Shelia and me nearer the top of this page for a good look at a good beachcombing cove. The agent would tell me that it would be cheaper to buy an all-day family pass instead. I would give him about fourteen euros (about $19), and we could go anywhere we wanted along the DART, getting on and off as many times as we wished that day. Then we would go out on the platform and wait for the train. The DART trains we rode were all "double-ended." That is, they had an electric locomotive on each end. On very heavy runs, the DART sometimes coupled two of these "push-me-pull-yous" together, so there would be two locomotives facing each other in the middle of the train as well. However many locomotives there were, they were all controlled by one driver. At Greystones, which was the southernmost stop on the DART line, the driver had only to walk from one end of the train to the other. 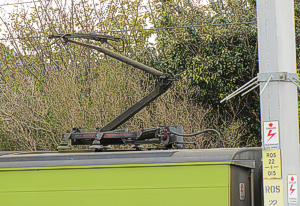 The photo to the right shows the pantograph of a typical DART locomotive - I include it because it's hard to make out in the other photos. To the right of the photo you'll also see the kind of barriers that were installed on the poles that supported the electrical wires. They seemed to be designed to keep large animals from climbing the poles and electrocuting themselves on the power lines, but they were not used in the country, only near the stations. Maybe they were there to keep drunks or would-be graffiti taggers from electrocuting themselves. It's worth mentioning that DART (Dublin Area Rapid Transit, in case you've forgotten) is part of an east-coast network called Commuter Rail, which includes diesel-electric-powered trains that go beyond the reaches of DART's electric services. Both are owned by the Irish Rail system, a monopoly in Ireland, but one that is closely regulated so it tends to provide first-rate commuter service at reasonable prices - proof that you don't need Nazis to have trains that run on time. The "correct" name for Irish Rail is Iarnród Éireann of which the first word seems to be related to "iron road," so it's not as "foreign" as you might think. One of the things that was confusing at first, was that if I did a Google search for "DART Ireland," I would see what looked like an official DART site, but when I would click on it, the page would just say " Iarnród Éireann" and I would wonder if I was even on the right web page. Turns out I was. That said, all of the rail travel we did in Ireland was on the DART, so that's the only part I can really comment on intelligently. If you look at a Dublin area map of all the rail service in Dublin, you'll see DART, Commuter Rail, intercity rail lines, and street-level traction lines crossing and occasionally overlapping. But in the greater Dublin area you can get most of where you need to go with just the DART, so that's where we stayed. I learned later that all Iarnród Éireann trains (including DART trains) run on "Irish Broad Gauge" - 5'3", a gauge that is used only in Ireland and part of Australia. It's about 11% wider than 99% of train tracks in North America, but the DART trains are so low and lean that you could probably model them on 4'8.5" track and no one would notice anything "wrong." 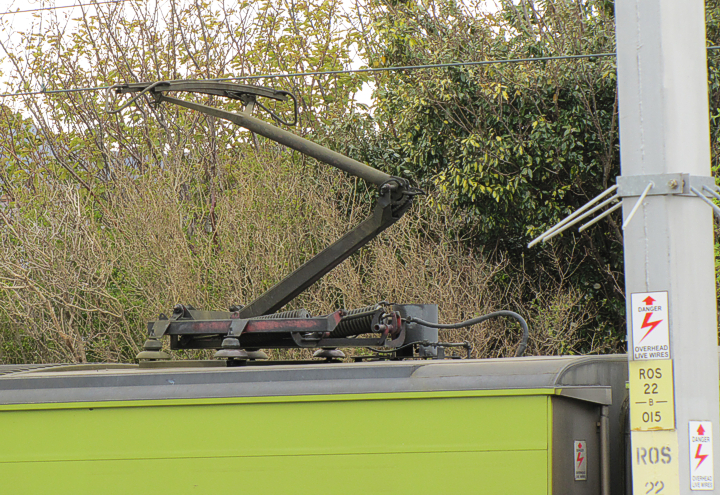 Like most European railroads, the rails rest on concrete ties (which they call "sleepers"). I will say this for the DART's right-of-way - it's far smoother than I'm used to on American trains - the DART trains glide above ground as smoothly as a well-kept subway train glides below ground. The map to the right shows the actual shape of the DART line (most maps at the stations or on the trains just show straight lines with the names of the stations). Depending on how you figure it, Dublin's contiguous suburbs extend about as far south as Booterstown and as far north as Killester. When you get north or south of those stations, you find yourself, at least briefly, in the country, traveling between separated, and increasingly picturesque towns. 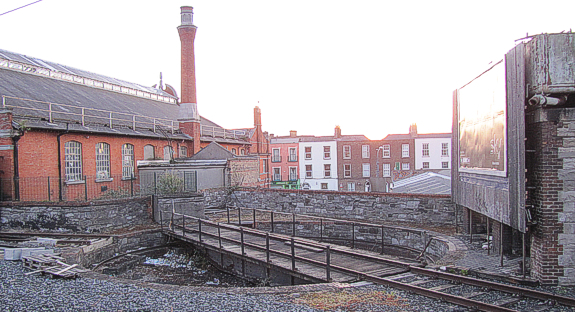 The closest stations to downtown areas of interest seem to be Grand Canal Dock, Pearse, Tara, and Connolly. We got off or on at Pearse and Connolly several times - Pearse is closest to Trinity College and several other popular sites in Dublin, and the Connolly station has the most connections to other rail lines and busses. When you left Greystones on the DART, the signage on the platform and inside the coaches usually said they were destined for Howth or Malahide, although they usually displayed the Irish spelling first. That said, if you were going to get off at Pearse or Connolly anyway, it didn't matter whether the train was going to end up at Howth or Malahide. Similarly, if you were at Howth or Malahide, the trains usually said they were destined for Bray or Graystones (some trains went only to Bray). If you were going from Howth to Connolly or even to Bray, it didn't really matter whether the train said Bray or Graystones. But if you were planning to go to Graystones - especially in the evening when the schedule thinned out - you might find yourself boarding a train "for Bray," then getting off at Connolly (if the weather was bad) or Bray (if the weather was good), then waiting for a train that specifically said "Graystones." Travelers might wonder why the DART doesn't also have a line to the airport? The answer is that one was planned that would actually include a bit of "underground" through northern Dublin. But the current recession has put those plans on hold, maybe permanently. Number-crunchers tell us that extending the above-ground DART to the airport would cost a small fraction of the proposed partially-below-ground route. So we'll see. I would NOT mind bypassing the bus, mind you, but I bet Aircoach and Airlink both see the delay as a reprieve. While we were waiting at Greystones for a bit, I took a look at materials posted around the station that told more about railways in the region. 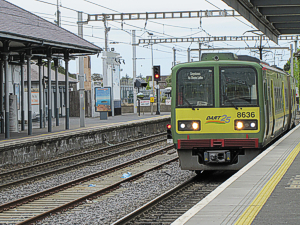 Greystones is not only the southernmost tip of the DART system; it is also a connection point for the diesel-powered inter-city trains that go down the east coast of Ireland or connect to south-central cities. It turns out that the biggest problem in getting rail service to Greystones 150 years ago wasn't at Greystones - it was a few miles to the north at Bray. "Bray Head" is a huge rock outcropping that juts out well into the Irish Sea. While it's picturesque and contributes to Bray's reputation as a tourist town, it presented quite an obstacle for rail lines south of Dublin. In fact, you can "see" Bray Head in the map above - it causes the big "bump" between Bray and Greystones. 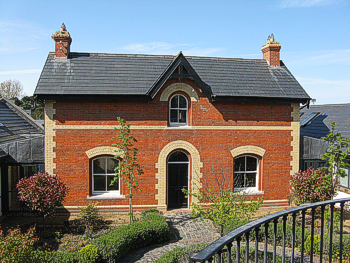 The railway line to Greystones was opened on the 30th October 1855. Initially a section of the rail track ran over two wooden bridges at Bray Head designed by the famous railway engineer Isambard Kingdom Brunel. 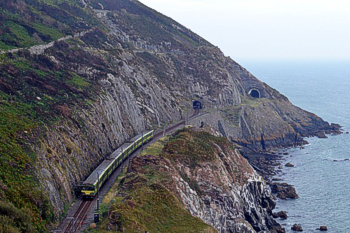 Later on, the line was diverted through tunnels, which involved hazardous tunneling around the side of Bray Head. 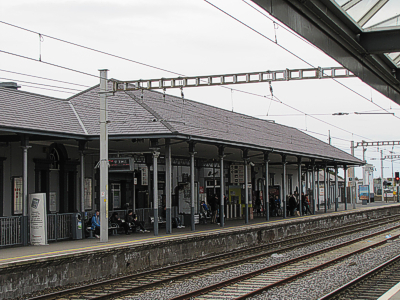 Greystones Station was originally named as Delgany, it because Greystones and Delgany in 1886 and was finally named Greystones in 1914. In 2000, the DART was extended to Greystones. 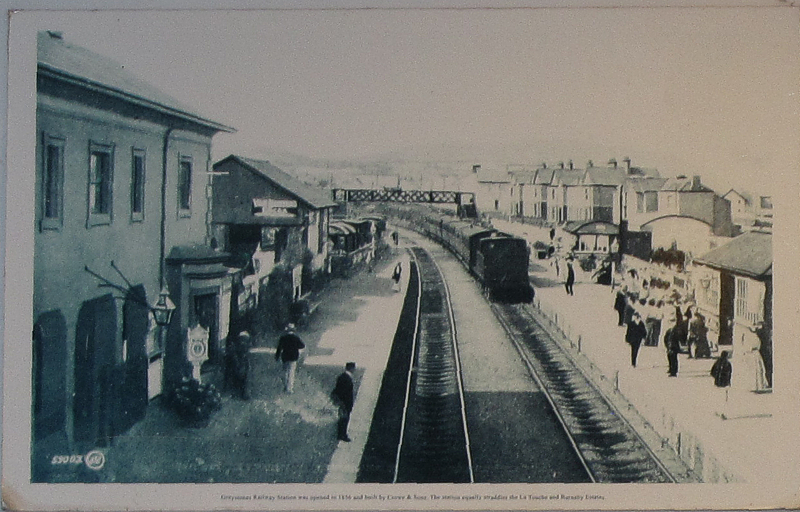 This undated postcard that was included in a display at Greystones seems to be a view of the Greystones station platforms in the late 1800s. Not much has changed, except for more shelter being added over the years. Bray is a somewhat wealthier town six miles north of Graystones. For years, it was the southernmost point of the DART line, and is still listed as such in some materials. As mentioned above, much of the history of rail travel south from Dublin was a history of navigating Bray's rocky promentories. Further north, several of the DART stops are little more than waiting platforms. The stations at Bray and Greystones, however were full-service railroad stations in their day, and they still carry architectural details and artifacts of those days. 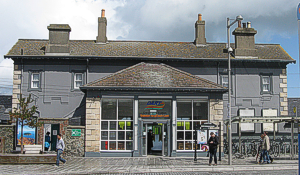 Both Greystones and Bray stations have one northbound and one southbound mainline. (A passing or storage track is visible in some of the photos.) As you can see in the tunnel photo above, the right-of-way is actually only one track. 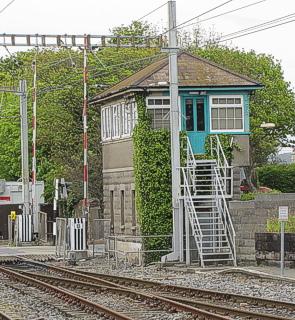 The little switch towers that used to shunt the trains to the correct track as they approached the station are still standing, not only at Bray, but also at a few other stations. They're never very tall by U.S. standards - but they never had to oversee more than a few lines at a time. Like the switch towers in American train yards, these towers were made obsolete, first by simple electrical controls, and eventually by computer control. 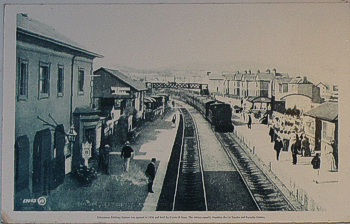 Both Bray and Greystones stations are west of the track. If you're planning on going north, you wait on the same side as the station. If you're planning to go south, you cross the tracks, using an elevated pedestrian crossing, and wait on the waiting platform on the eastern side of the track. Interestingly enough, the only "grade crossing" I noticed on the DART was at Bray - most of the track is either elevated enough for traffic to pass under or hugs the seawall closely enough that there's no reason for automobiles to cross the right of way. You can see the crossing gates for that grade crossing just to the left of the tower in the photo. Bray had several other features that deserve closer inspection. My favorite was a series of painted murals celebrating over a century and a half of the town's railroad history. When we were there, several of the original paintings had been converted over to mosaics, a very nice look that will almost certainly require less maintenance. A couple of the original paintings were still there, too, showing serious weather damage, and a couple more were replaced by line drawings showing where the tiles will go eventually, when those murals get sponsors. A very nice way to tie the present to the past, if you ask me. 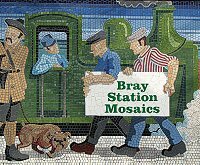 I've posted thumbnails of those mosaics on the Bray Station Mosaics page. 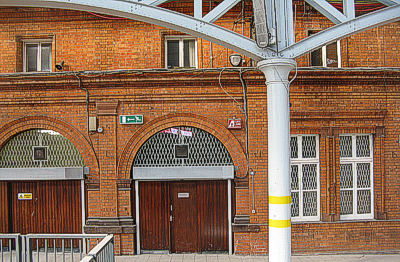 Four DART stations serve the core of Dublin. Going from South to North, they are Grand Canal Dock, Tara Street, Pearse, and Connolly. Pearse is the closest station to Trinity College and some trendy shopping disricts. But Connolly is a frequent transfer point, and close to the bus station, so we found ourselves cooling our heels there more than once. Always on the lookout for historical railroad remnants, I found the Victorian-meets-space-age architecture of the building interesting. This is an inside view of one of the old entrances to the platform. 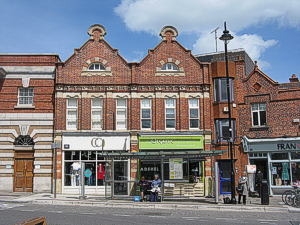 You can clearly see the orange brick that is used everywhere except the facade, as well as the iron supports for the canopy, shown below. In the view to of the canopy, you can see the "boards" that announce which trains are coming next. Usually they announce the next two or three trains, so you have some idea how long you have to wait. Generally, the board for the southbound trains alternate between Greystones and Bray, although they'll occasionally show another location, if the train is truly a local, or if it is a "commuter train" that goes beyond the electrified DART rails. Similarly, the northbound trains will usually alternate between Howth and Malahide. Both platforms are up a long flight of stairs from the station entrance. If you go up, then realize you are on the wrong platform, you have to go back down, cross to the other stairs, and climb back up. That's a mistake most people don't make twice. Some of the outside station platforms added some wooden trim that, to me, was more reminiscent of the American West than of either Victorian or modern-era construction. It didn't bother me, of course. Since I took this photo, I realized that some of the other stations had a slightly different "gingerbread" pattern, so if you wanted to "change it up" on a model station, feel free. 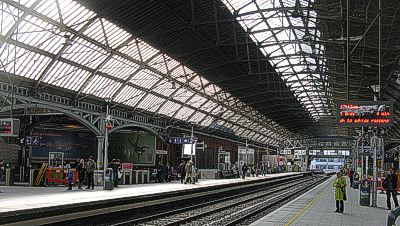 In the photo to the right you can also see that the original orange brick of the original station has been painted gray in the waiting area. 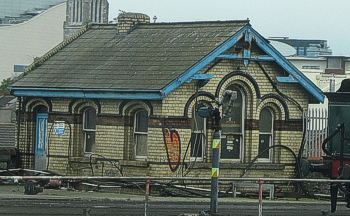 That said, there were some VERY interesting things to see outside Connolly station including a very old station-looking structure that you can only see from the train, so I'm including those to give a flavor of what Connolly's operations must have been like a century and a half ago. I had no idea what the building to the right was for until I got my camera home and looked closely at this photo - it's what's left of a Victorian-era, rectangular, water tank! The original structure is at least three times as long as it was wide, but you can't see the long side because it's being used as a billboard. As far as I can tell, the arch motif was repeated on the long side. Just beside the water tank was a find that was just as exciting - an ancient turntable that must have been only 25 or 30 feet across. (You can't get to these structures, so it's not like I could pace them off.) I'm guessing it was used during the mid-1800s to turn locomotives that were going from one end of a passenger train to the other for a return trip. 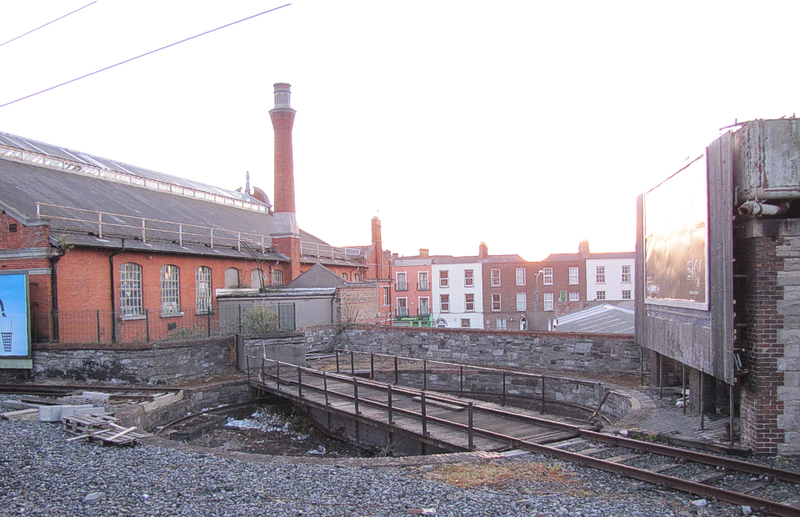 To the left in the photo below, you can see an upper wall of Connolly station. To the right, you can see the billboard covering the long side of the old water tower. This must have been quite the hub of activity a hundred and fifty years ago. THANK YOU, IE, for leaving these historical structures be instead of tearing them up to make room for a storage shed or something. In fact, it would be great to see both relics cleaned up and given appropriate signage for tourists who otherwise wouldn't know what they were looking at. 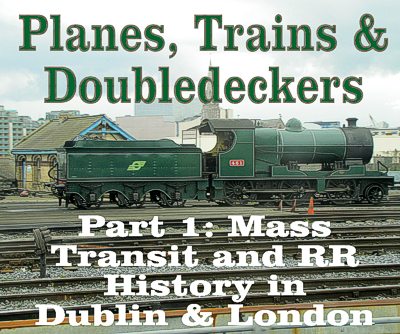 Can you tell why I'm thinking that the history of early railways in Ireland is just as fascinating as any other country's? 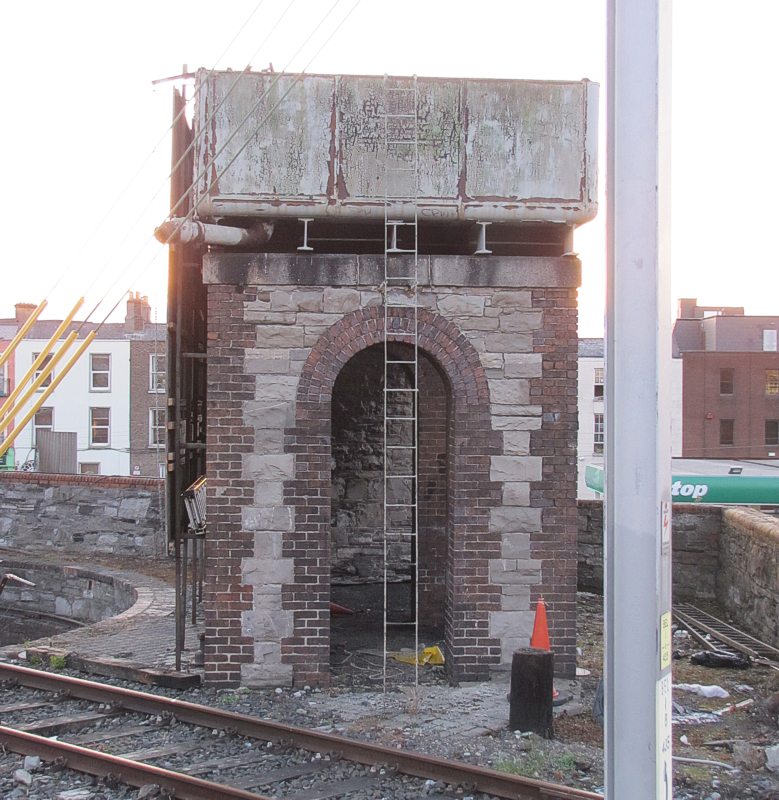 That said, the most fascinating relics outside Connolly station could only be seen from the train, so if our photos look a little blurry, that's why. 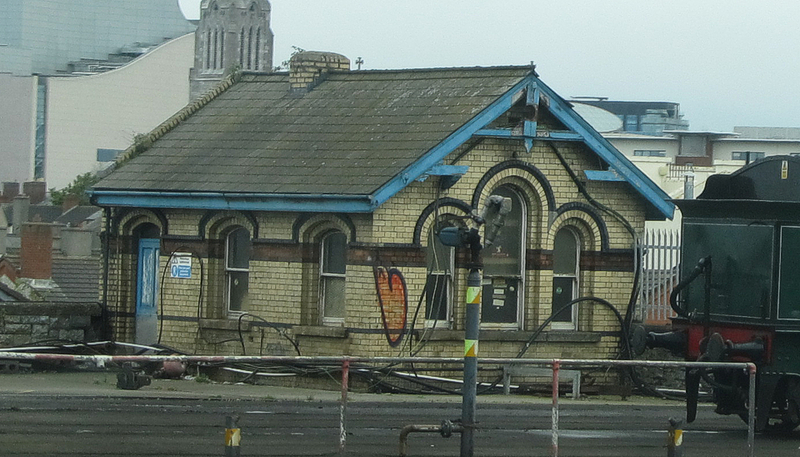 The first day we went north of Dublin, I noticed a tiny station-looking building in the rail yard. The next time we went past it, I tried to snag a photo, but it was too dark to get anything worthwhile. So we were really watching for it the next time we went past. My new camera would only snag one shot, because I had the settings wrong, but daughter Molly's camera got two great shots. By then, there was a bonus - an old steamer was now next to the station - part of the steam excursions we had missed. It was certainly fun to see the thing out in a real railroad yard. As always, clicking on the photo will get you a hi-rez version. According to the Railway Preservation Society of Ireland, this is a Great Southern Railways K2 Class 2-6-0, originally built in 1922. She was rebuilt at least twice. Then after a long period of disuse and partial dismemberment, she was restored by RPSI in 1990, with another rebuild in 2001. Because she was technically built as a freight locomotive, most of her lifetime was spent black, but after 2001, she received green paint, to honor the decades of passenger service she had also provided. For more information, click here. 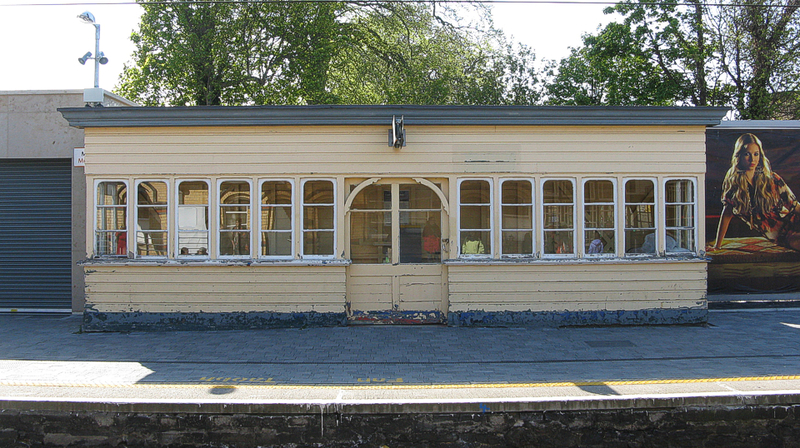 After that, the little station might seem to be an anti-climax, but you have to admit, it's as cute as a bunny. Or was once. 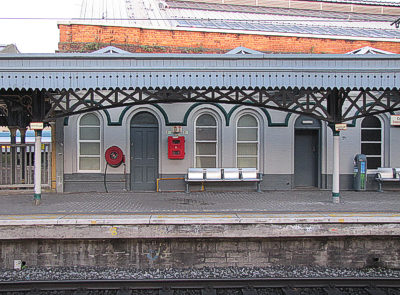 From the DART rails, all you can really see are the charming window shapes and bright blue trim. Once I got the photo on my computer, I could see the random-seeming black plastic conduit running all over the building's exterior, as well as some tagging. 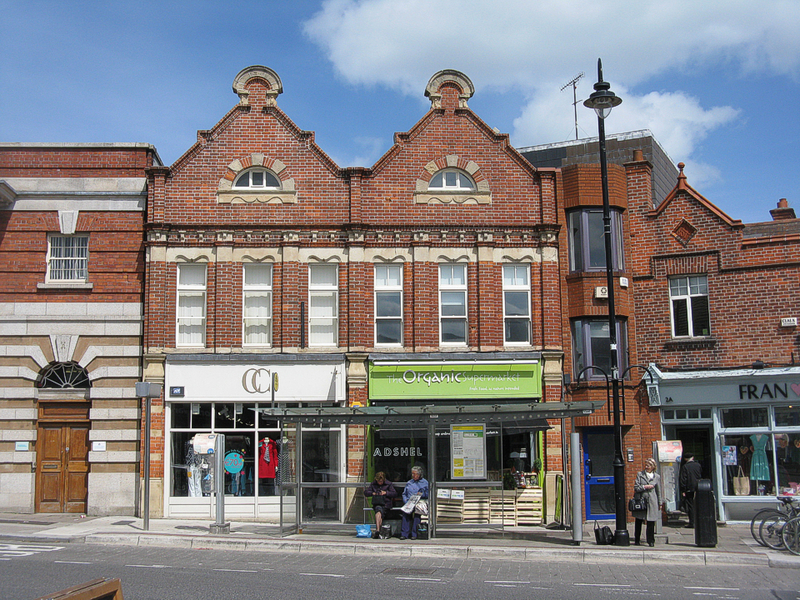 But the building is still architecturally interesting. 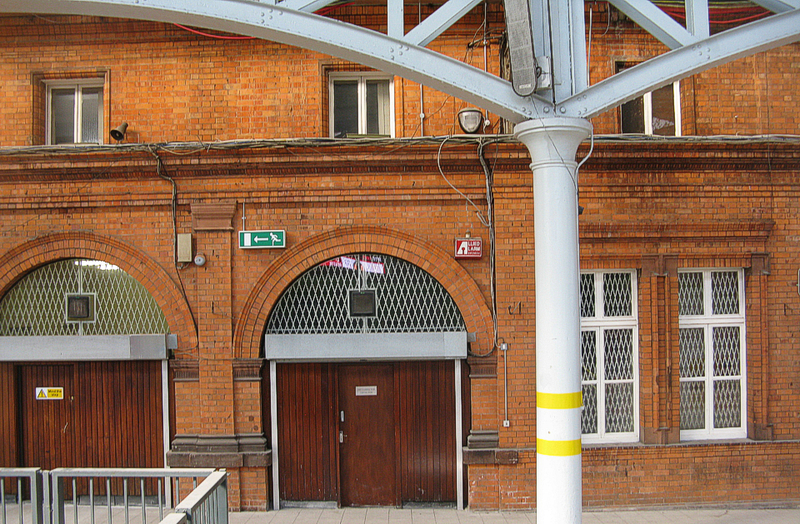 Was this the original Connolly station? Or maybe a freestanding waiting room or office? Here's a thought - if you want to model a real-world railroad with "Isle of Sodor" charm, you don't have to look beyond 19th-century Ireland. I have other resources I hope to bring online soon that may give you some additional inspiration. One Sunday we took the DART up to Howth, a northern terminal, and a picturesque coastal town where I took a lot of photos of boats and fisheries and the like. There was also a great open-air market (only on Sundays) and a used bookstore with volumes I guarantee you will never see in North America. 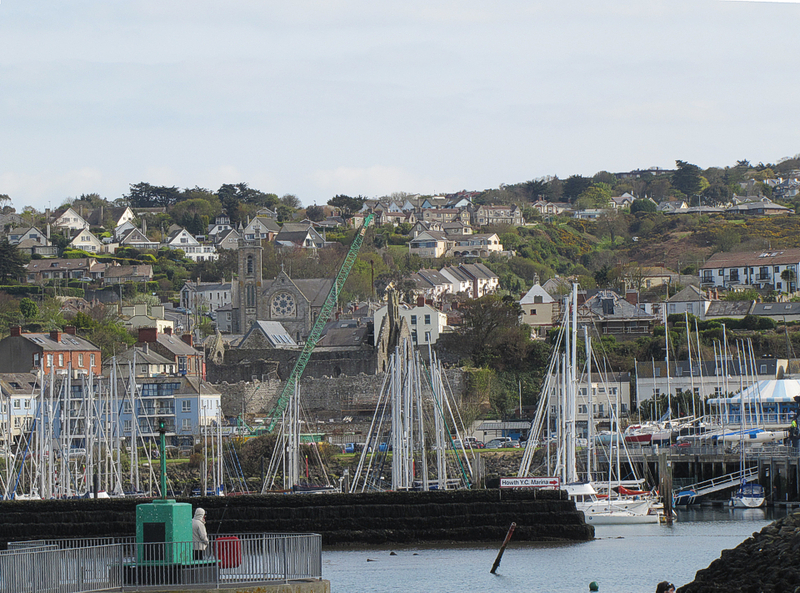 I list Howth here because it's very picturesque, you'll enjoy the market if you get to it. You may also have time to visit the "National" Transportation Museum. 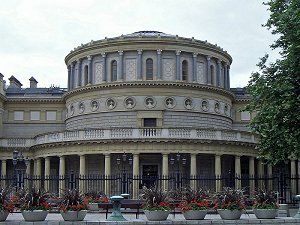 I put quotes around "National," because unlike the big Dublin museums, this one is supported, not by the government, but by volunteers and low entry fees - currently 3 Euros for adults and €1.25 for children. Malahide is the other northern terminus of the DART. We went up to visit a castle that is still inhabited, but whose grounds are open certain times of the year. The family was at home when we went, so we had to content ourselves with looking at the grounds from across a barrier. Not to be discouraged, however, we took lots of photos, When something's that big, being the length of a football field away from it doesn't keep you from getting good pictures. 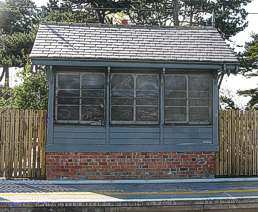 including photos of the old and new Malahide stations. 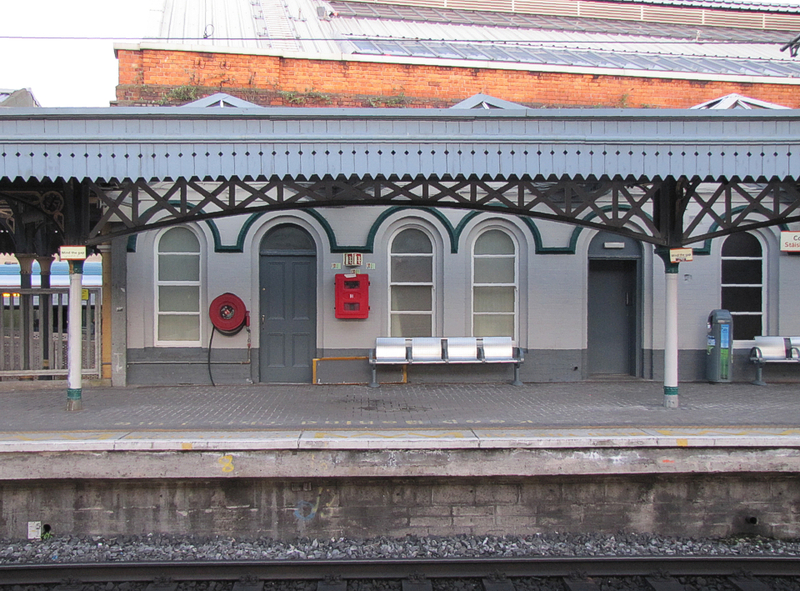 The "new" Malahide station looks like a classic 19th-century station with a faux-Tudor entrance glommed on. 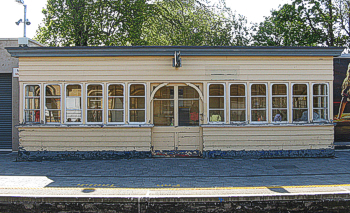 The platform side, however, looked much more traditional. Why say "new" about a station that one site claims was built in 1847? 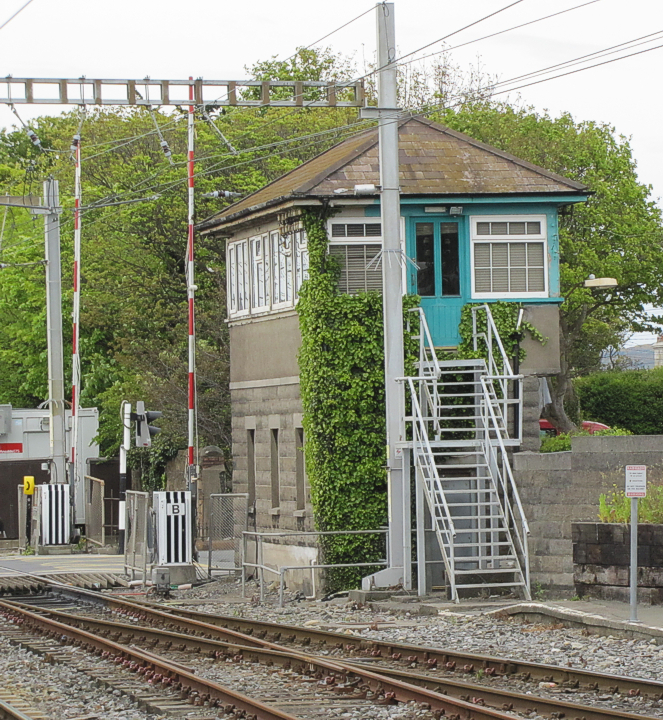 Because we actually saw Malahide's first station station (below) on our walk through town. Now that I study the photos, I realize that the "modern-looking," glass-intensive part of the building was once open (what Americans call a "breezeway"). If so, whichever architect decided that adding modern-looking glass with a faux-Tudor paint job was an improvement ought to be extradited to a country with capital punishment. All of the charm of the terminus was not lost, however. 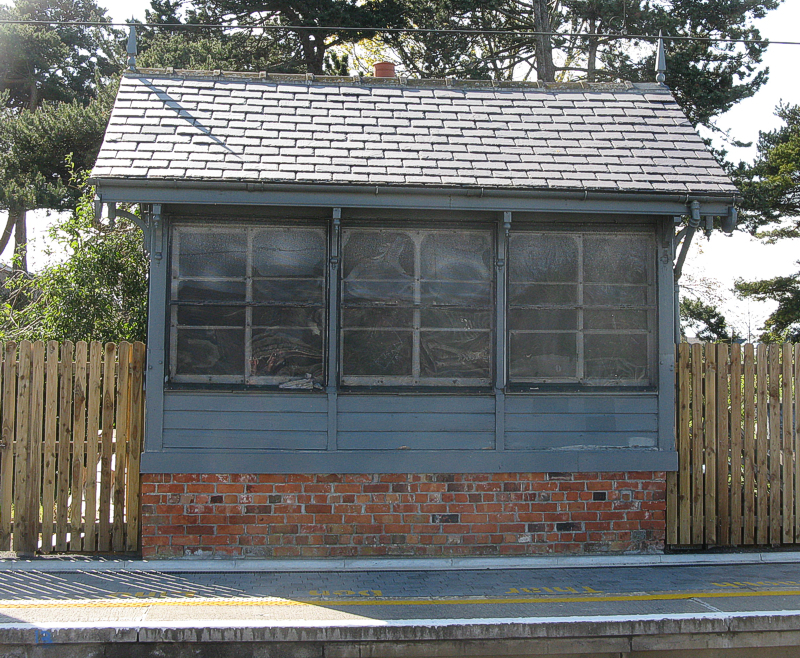 Malahide still has its (unused) dinky switch tower and a very unusual covered waiting platform that - to me - looked more like a diner than a railroad station facility. 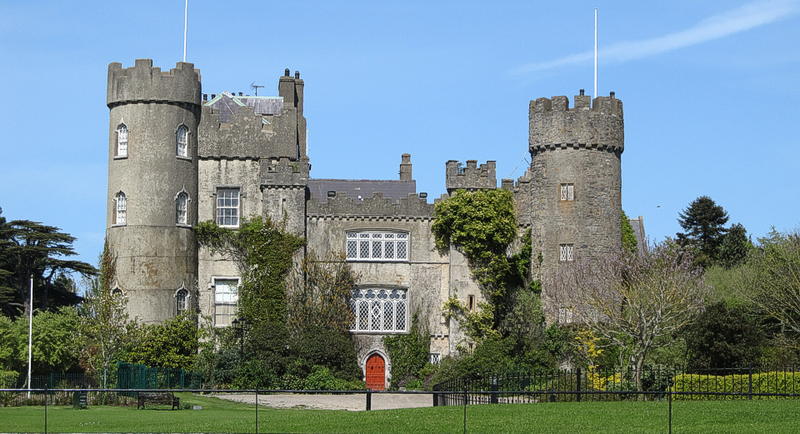 On our walk back from the castle, we walked back through the "edge" of Malahide. Most of the town near the railway station(s) is residential, so we didn't pass the sort of candy stores, bakeries, and Chinese restaurants that we saw in most towns near the DART stations. 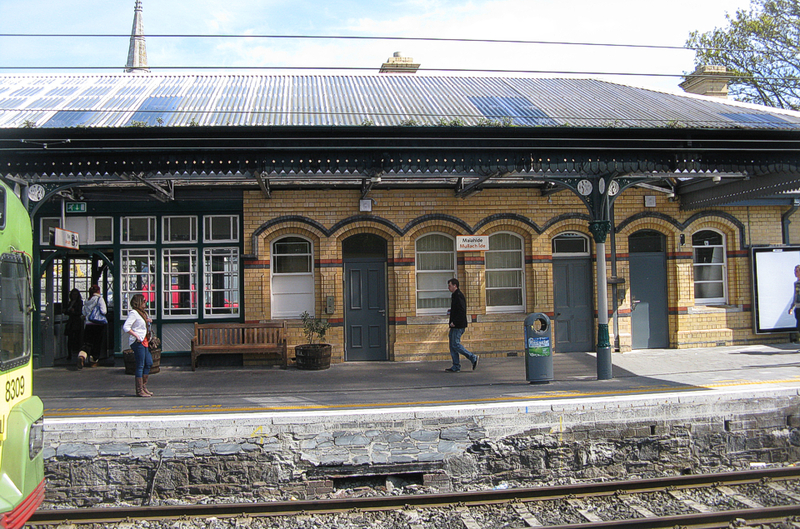 But we did see the "old" Malahide station, a charming two-story brick that predates the two-platform station currently in use. What was I saying earlier about "Isle of Sodor" charm? So we had to get off at the next station, wait for a train back to Howth Junction (which is really just a waiting platform), then wait for a train to Malahide. It added an hour to our trip, since we had to wait for two more trains, but the weather was kind. If it had been bitterly cold, I may have had stronger opinions about the mixup though. Shelia and I "did" Dublin by ourselves one day - we took the Dart to Pearse station, visited Trinity, saw the Book of Kells exhibit and the Long Room, ate at a highly-recommended but "okay" restaurant, visited the Museum of Natural History, and several other neat places. In the process, we went up Grafton Street, one of Dublin's most upscale shopping districts, but neither of us enjoys shopping at "trendy" places, so we didn't actually buy anything there. One tip if you're going to see the Book of Kells and Long Room - get there early to avoid the school field trip and bus tour crowds. 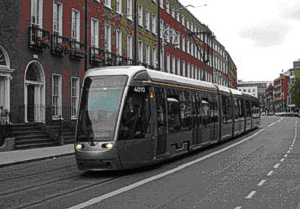 On the Dublin streets is a very local transportation system - the LUAS tram system. The LUAS trains have a very low profile compared to most streetcars and busses, and they are very quiet. In fact when the system went in, they had trouble getting pedestrians to notice the trains and move out of the way. For Dublin residents who live or work along the system, they are an excellent option. That said, we never took a LUAS train, because we were either traveling to or from Dublin, never within the city. But they have a very good reputation among tram fans. Interestingly enough, LUAS has two separate lines who come closest to each other at City Center, not too far from Connolly station. There have been plans to connect the lines for years, but it hasn't happened yet. In London, we had experiences with the "Tube" and a little experience with busses. After a three-night stay there, we returned to Greystones, then took a day trip to Galway before finally heading back to Ohio. Our second part doesn't have as many train-related photos as the first part, but it does have relate an interesting story about a commercial bus snafu that almost left us stranded overnight at a bus garage in Dublin. So take a look.